"This authentic Mexican pork carnitas recipe takes very little effort and uses only a handful of ingredients. Just the way we make it in Mexico: lots of flavor and no fuss. 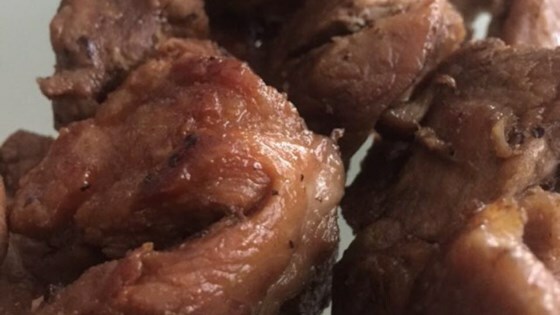 [Recipe originally submitted to Allrecipes.com.mx]"
Trim excess fat from pork shoulder and cut pork into 2-inch cubes. Season with salt and pepper on all sides. Heat a cast iron braiser over medium-high heat. Pour oil into the pot and brown pork on all sides, about 10 minutes. Cover with the lid. Bake in the preheated oven until pork is crispy on the outside and soft, but fully cooked, on the inside, about 1 hour. If you are not using a cast iron braiser with a cast iron lid, the cook time will be about 20 minutes longer.